After years of effort, the work of Nancy Odom, State Wildflower Chairman for the Garden Club of South Carolina paid off when, on May 14, 2003, Governor Mark Sanford signed legislation making goldenrod (Solidago altissima), the species commonly called tall goldenrod, the official wildflower of South Carolina. Spearheading a statewide effort, Odom had contacted garden clubs throughout the state with her idea of a state wildflower to spark interest in native plantings. To educate the public, garden clubs were asked to present programs on wildflowers and then nominate a preferred flower for promotion as the state's official wildflower. Queen Anne's lace was the big winner with the clubs, but it was determined that this plant was not native to South Carolina. The runner-up, goldenrod moved to the forefront. Bills introduced in the 114th Session of the General Assembly (2001-2002) failed to gain traction. Efforts continued however. House Bill No. 3233 of the 115th Session of the South Carolina General Assembly met a different fate. Introduced for the first time in the House on January 14, 2003 by Representative Scott F. Talley of Spartanburg, the offering met with a more receptive audience. House Bill No. 3233 was approved and on its way to the Senate before the end of the month. The Senate received House Bill No. 3233 and had approved the action by April 23rd. TO AMEND THE CODE OF LAWS OF SOUTH CAROLINA, 1976, BY ADDING SECTION 1 1 704 SO AS TO DESIGNATE GOLDENROD THE OFFICIAL STATE WILDFLOWER. Read the first time January 30, 2003. "Section 1-1-704. 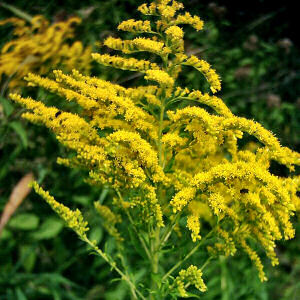 Goldenrod (Solidago altissima) is the official state wildflower." 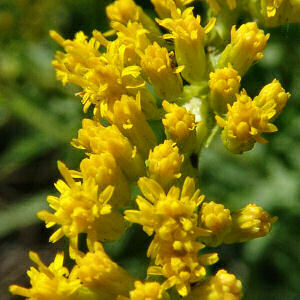 On May 14, 2003, the goldenrod (Solidago altissima) was adopted as the official state wildflower of South Carolina. South Carolina now has two official flowers. In 1924, the yellow jessamine was selected by the General Assembly as the official state flower of the state. Nebraska as their official floral emblem in 1895. Kentucky as their official state flower in 1926. The following information was excerpted from the South Carolina Code of Laws , Title 1, Chapter 1, Article 9, Section 1-1-704. "South Carolina Now Has a State Wildflower: Goldenrod." South Carolina Native Plant Society . State of South Carolina Native Plant Society, n.d. Web. 9 Sept. 2009. "H*3233 (Rat #0077, Act #0031 of 2003)." South Carolina Legislature . South Carolina Legislative Services Agency, 11 June 2003. Web. 8 Aug. 2016. "South Carolina Code of Laws." South Carolina Legislature . South Carolina Legislative Services Agency, 17 May 2016. Web. 8 Aug. 2016. Tall Goldenrod – South Carolina State Wildflower: South Carolina Information Highway. Plant Profile for Solidago altissima L.: USDA, NRCS. 2004. The PLANTS Database, Version 3.5 (http://plants.usda.gov). National Plant Data Center, Baton Rouge, LA 70874-4490 USA. South Carolina Native Plant Society: Web site of the South Carolina Native Plant Society. Roadside Use of Native Plants: US Department of Transportation, Federal Highway Administration. Wildflower Gardening in South Carolina : South Carolina Department of Transportation an Clemson University Extension: EC 680, Revised May 2002. More symbols & emblems: Complete list of official South Carolina state symbols from NETSTATE.COM. Although relatively small in size, the Palmetto State hosts a remarkable variety of wildflower species, from the trillium and bloodroot that brighten its forests to heliotrope and common toadflax that dot the state's roadsides and fields. With color photographs (all by Richard D. Porcher) and extensive descriptions of more than 680 species, A Guide to the Wildflowers of South Carolina offers a complete and indispensable reference for finding and appreciating these natural treasures. Species are grouped by habitat. species according to habitat. For each species identified, the authors include interesting facts - many not widely known or readily available - about rarity, suitability for garden cultivation, and origin of common and scientific names. Orchids in any setting make for a beautiful sight, but native orchids growing in their natural habitats offer an especially rewarding view for plant enthusiasts, naturalists, and nature lovers of all ages. South Carolina hosts a rich potpourri of these enormously popular wildflowers, thanks in large part to its unique position as the lower boundary of more northerly species and upper boundary of species found in Florida and the gulf states. In Wild Orchids of South Carolina , James Alexander Fowler captures with spectacular photography and encyclopedic knowledge the full glory of the state's native orchid population. From the bogs and bays of the coastal plain to the mountain woodlands, Fowler catalogs rare and widely distributed species, offering a wealth of information for identifying these prized plants. In addition to providing photographs of each species, Fowler includes common and scientific names, flower descriptions, bloom times, ranges, habitats, pollinators, and refreshingly candid personal observations about the orchids as he encountered them in the wild. He details his experiences of coming upon a show-stopping colony of large yellow lady's slipper orchids (Cypripedium parviflorum var. pubescens) and of locating the rare monkey-face orchid (Platanthera integrilabia). Paul Martin Brown, a nationally renowned botanist and wild-orchid specialist, provides an introduction to the volume. He explains South Carolina's significance in the larger context of North American orchid habitats and prepares the reader for the striking display of beauty and information assembled in this volume.